Intel, Qualcomm, Apple, all reported earnings in significant excess to what was expected. Market participants IMO are still far too pessimistic. Well, I don't understand these charts at all, but I still think all gold is fool's gold. Assets that can generate income, and even increasing amounts of income over time, are the sorts of investments I like. Investors are chary now, and maybe they have a right to be. Who knows where is the next Long-Term Capital Management, or one-day 22 percent drop on the Dow (1987). The tech bubble. The Bush years. Still, I think we are on the cusp of a global boom, that will include the USA. I am especially interested in the yuan gaining ground as international reserve currency, thus reducing the exchange rate for the dollar. As there are chronic gluts of capital, I do not think this will raise interest rates in the USA, but will result in a surge of exports. Look for secualr bull markets in real estate and equities. Gold may rally, as more Chinese and Indians buy baubles. So be it. Charts are farts from the past. They have zero abilities as to predicting the future. It is a market of stocks. Not a stock market. Over these same time periods, there have been plenty of stocks that have far better returns than gold and or silver. When models and or charts turn on, brains turn off. I was looking at this chart last week also. The problem is, I don't know what it tells me. How does it revert to trend? Stocks up? Gold down? 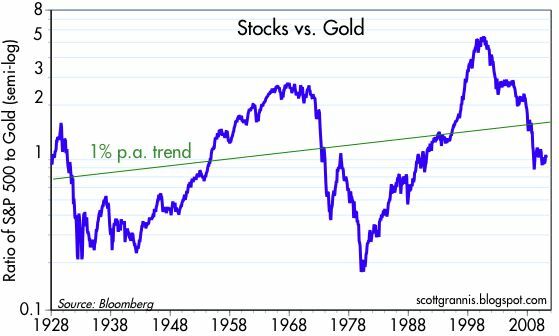 Stocks up more than gold? What? It seems that most people do not understand gold. That includes some who post here. Gold is indeed a tangible, "hard" asset, and not a "productive" asset like a stock, which is a claim against the future cash flows of a particular company. 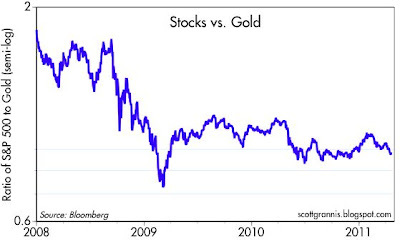 In relation to the aforementioned gold is not a good investment. Neither is it a bad investment. Gold is not an investment at all - it's a CURRENCY. When the central banksters of a country deliberately debase that nation's currency, and deny the holders of that currency any REAL return on said currency, then gold - being the ultimate currency - will outperform not only the currency being trashed ("Bernankeed"), but that country's equity market as well. How can increasing earnings of a rapidly declining currency provide a "real" return to shareholders? And this doesn't even take into consideration the impending fiscal disaster faced by the United States. Also, ask yourself this question: the central banks have had 40 years to dispose of this useless, barbaric relic, yet they haven't done so; why? Because they know that they issue CONfidence money that has no intrinsic value. And with a knowledge of monetary history they also know that EVERY Fiat currency system has ended in ruin, beginning with the origin of paper money in the Middle Kingdom. Since they don't trust each other, then why should we trust them?